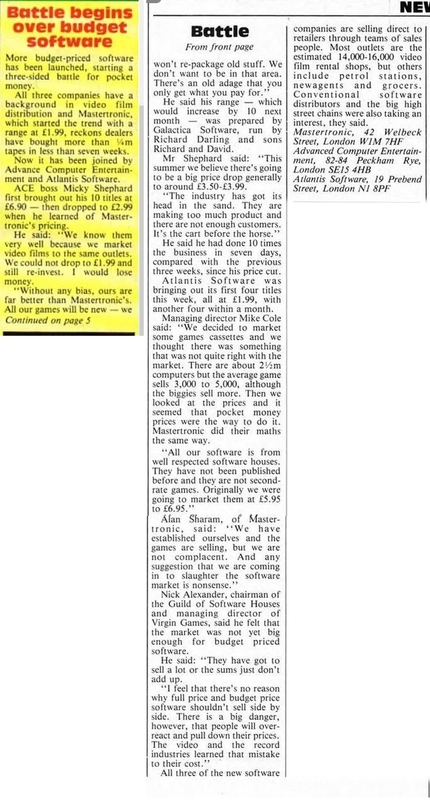 Home Computing Weekly, 22 May 1984, reported on the growing interest in budget software. The really fascinating nugget in this piece is the reference to Galactic (not "Galactica") Software, the company run by Jim (not by Richard) Darling. This is precisely the time when the Darling boys began writing for Mastertronic and ceased to run Galactic. Whether the story is true and there was a very sudden shift of alleigance by the Darlings, or HCW simply got it wrong, is hard to tell.